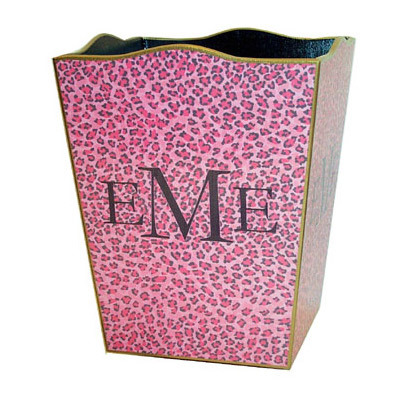 This wastebasket is 11″ square wood painted in Leopard print, and it can be ordered with or without personalization. If ordering a monogram, please enter the monogram below in the order you wish your letters to appear from left to right. Please note that as in traditional monogramming, the middle letter will be larger than the other two. Wastebasket may also be personalized with a name. Consider coordinating this with the Pink Toile Decoupage Frame also available, making this an exceptional gift.